With the return of the Perseid Meteor showers, coming on August 14th, I though a more in depth blog on this topic would be timely. Last week I only showed the modified version of my light painted tree against the night sky at Ponderosa State Park. This was also my first attempt at the capture of some meteors, when the Perseid Meteor showers visited. Not only did I get a meteor, it was going into the frame and towards my tree! A great bit of luck. 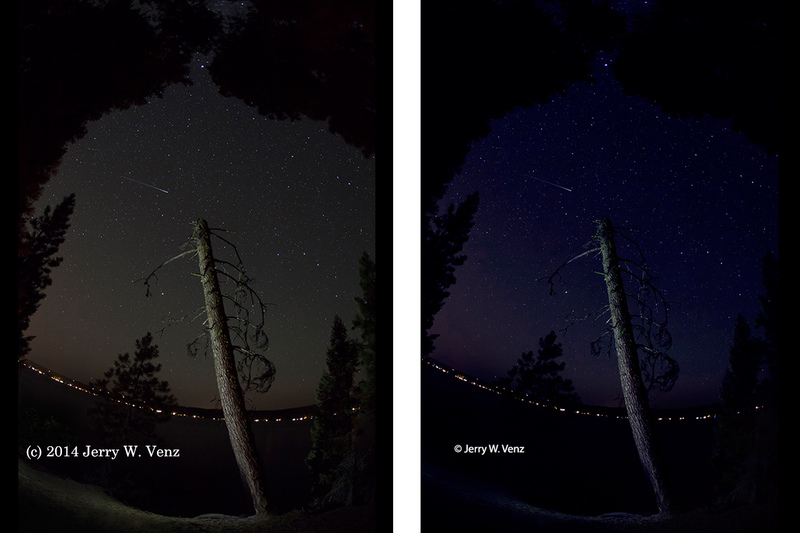 As you can see, the before image, on the left, picked up A LOT of light pollution from the nearby town. The sky is not remotely dark and I painted too much light on the ground around the base of the tree. The light pollution is a common problem unless you're in a really remote location. Doing some research I found, on astropix.com, a technique in Photoshop to darken the night sky. The basic technique is done by going to the info palette, using the eye dropper, and after selecting a sample area of the sky, you reset the Black Point in the Red, Green and Blue channels to either neutralize the sky color or perhaps add a different touch of color to your sky. I went with some blue to counter act the reddish cast I was getting from the town. For the details of this technique see the article titled: Basic Photoshop Image Correction for astrophotos from Catching the Light by Jerry Lodriguss (www.astropix.com). When combining light painting with stars I wanted two things: enough time to do the light painting and I want the stars to be sharp, appearing motionless and not streaking. To do this I need a very wide angle lens that will allow me to use a long shutter speed to accomplish my goal. 450 divided by the lens focal length (in millimeters) equals the longest exposure time in seconds for that lens. So, with my Canon 5DMKII using my Canon 15mm f2.8 fisheye lens the calculation is: 450 ÷ 15 = 30 seconds. That calculation will only give me the time I need and sharp stars NOT the proper exposure for the scene. That you must work out based on what your camera's imaging quality is at high ISOs and the aperture you want to use. In my case I used f2.8, focused on the tree and used 3200 ISO (based on testing) for a good exposure at 20 seconds. Note: This formula is only exact for the full-frame, 35mm, format. If you're using an APS-C sized camera sensor, with it's narrower angle of view, you must reduce the shutter time. In this case with my 15mm lens the shutter time would be reduced to 20 seconds. (I have listed the site information at the end of this blog for a great chart for this data.) The same rules applies to any lens you use--it's all about angle of view. Not only would this lens show a lot less sky, but with only 9 seconds, you could not do much painting. In addition, with an exposure of only 9 seconds, even if your 50mm lens has a maximum aperture of f1.2 you would still need to expose at an inanely high ISO to pick up any stars. As a final tip, when doing all this night time photography, I suggest you have Red LED flashlights available, even if you're not going to light paint with the red, to use to navigate back to your camera, and for use when setting up the camera, so as to preserve your night vision. Til next week...if you have questions don't hesitate to ask. Site Information mentioned above: www.intothenightphoto.blogspot.com In my '450' Rule to stop star trailing dated: Friday May 31, 2013.